Thanks for coming to spend 5 minutes with me! It has been a busy week but a good week. Bring on the weekend! Today I discovered that my new blogging friend Danielle from the wonderful blog Transforming Home has given me a couple of "awards"! Thanks for thinking of me Danielle! I will place these on my side bar with pride! Since this is a time of Thanksgiving and because I am participating in 30 days of Giving Thanks with the Tatums, I have decided that I am going to dedicate these 2 awards to the many people who have made my new adventures in blogging so rewarding and special. 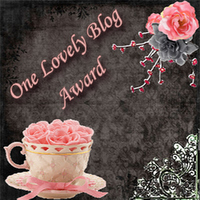 Every person who takes the time to read my posts or leave comments has been awarded as a "Lovely Blogger" and a "friend who is loved by me"!!! I am so grateful to the people who have signed up to follow me, who have left comments giving me advice and encouragement,who have taught me what a site feed is and who didn't get mad when I accidentally deleted their comments! Every day I have so many things to be thankful for but today I give thanks for the new friends I have met as a result of blogging. I never thought that blogging would become such an important part of my day but I really love it. I love spending time thinking about new recipes for Foodie Friday, new and exciting ways to set my table on Tablescape Thursday and the beautiful world around me on Outdoor Wednesdays. On top of that I have made friends from all around the world like Ange in France, Nat from New York, Ange from New Zealand, BJ from West Texas, Patricia in Dubai, and Rettabug from Ohio (who has family in Australia) to name just a few and there are still so many more amazing people I have yet to meet! The world sure is getting smaller! 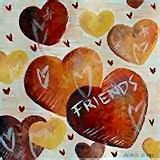 So, "Thank you" dear friends for helping me blog-it has been so nice to "meet" you! Natasha, I echo your comments! Meeting wonderful people, like you, is a blessing of blogging. I really enjoy your posts and look forward to your friendly comments. Thank you, friend. Congradulations on your well-deserved award. Congratulations on your award. I feel the same way you do about blogging (and so does everyone else, I think!). Congrats on your awards!!! I second you on how much FUN it has been meeting my blogging friends...I'm having a blast with my blog and I'm glad to hear that you are too. Hope you have a wonderful anf fun weekend! Fun awards for you, And icould not agree more, the world does seem pretty small with so many fun people to meet! Have a great weekend! Thanks for visiting my blog and commenting. I'm glad that you were able to sample some traditional American cuisine as well as some American folk music. Thank you for visiting my blog. I'm glad you enjoyed it. The bottom of the hurricanes are filled with acorns. They carry the harvest and brown theme through. Isn't it wonderful the extent of how much our world has opened up and the people we've met all because of a blog! When I was a young wife never in all of my life would I have imagined a venue like this for communication. Yes, a blessing for sure and without a doubt. NM - I am really touched and give sincere 'thanks' to you. I too was reflecting on how blogging had become an important part of my day in the car this morning. I am going to let my blog sleep in for the weekend though and will come back to it on Sunday night! Very happy sunny seaside weekend with your loved ones. Here we are having a rainy horsey weekend with mine. this blogging thing really is wonderful isn't it?!!! Nice place you have here Natasha. Thanks again for stopping by my blog. Bonjour! THank you so much for following my blog and your very kind comments. Congratulations on your awards, after reading through your posts they are well deserved! The verse about a friend being a treasure is so true! I will be following along and will be back soon. Thanks for stopping by my blog...and leaving such a kind comment. Hope you find some time to try those cookies...so far all of the people I have shared them with really like them!